Lanoue Chevrolet wants to thank and give recognition to the selfless acts of service you have provided to our country. 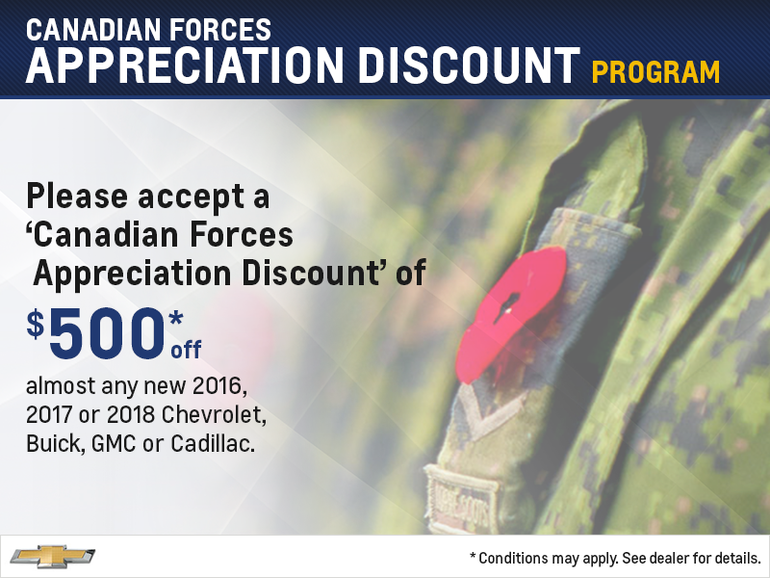 All active, reserve and veteran military personnel (including spouses) are eligible for the General Motors Canada 'Canadian Forces Appreciation Discount' of $500*. This discount applies to almost any new 2016, 2017, or 2018 Chevrolet. Even more, this discount can be combined with our other promotions offered at Lanoue Chevrolet. To accept your discount, please bring proof of your current or past Canadian Forces membership. We are happy to answer any question you may have in finding your new Chevrolet vehicle. Conditions apply. Please see dealer for details.